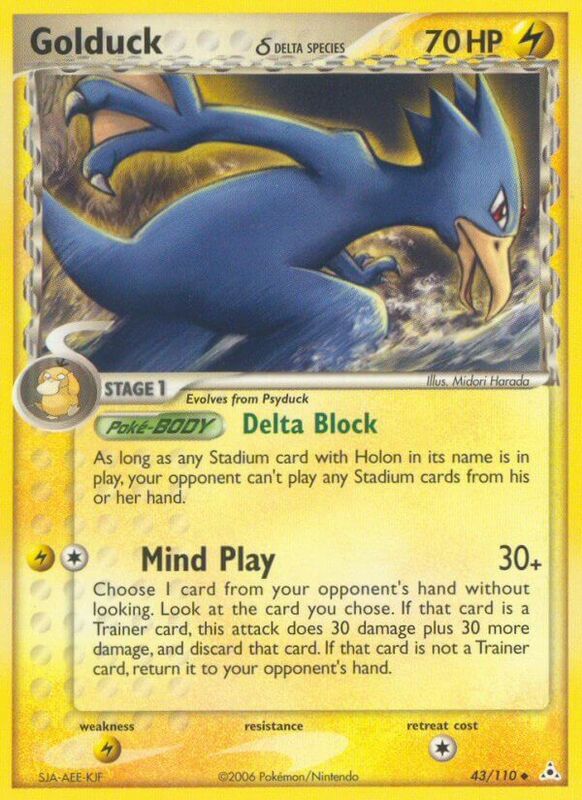 As long as any Stadium card with Holon in its name is in play, your opponent can’t play any Stadium cards from his or her hand. Choose 1 card from your opponent’s hand without looking. Look at the card you chose. If that card is a Trainer card, this attack does 30 damage plus 30 more damage, and discard that card. If that card is not a Trainer card, return it to your opponent’s hand. Such a cool and original Poke-Body, I remember a few people trying to use this at the time when Stadium wars were going on. It might start again soon with the new and powerful Plasma Stadiums coming out. How might an attack like this work with Omanyte’s clairvoyance? Do you still get to look at their hand? According to official past rulings regarding Omanyte and The Rocket’s Trap, the opponent would turn their hand face down and randomize it before you choose a card. Upsetting, I know.